Over the Christmas break, a friend came to visit us and she was wearing a gorgeous long cowl that she wrapped around her neck twice. It looked incredibly warm and comfy and it was quite the statement piece. 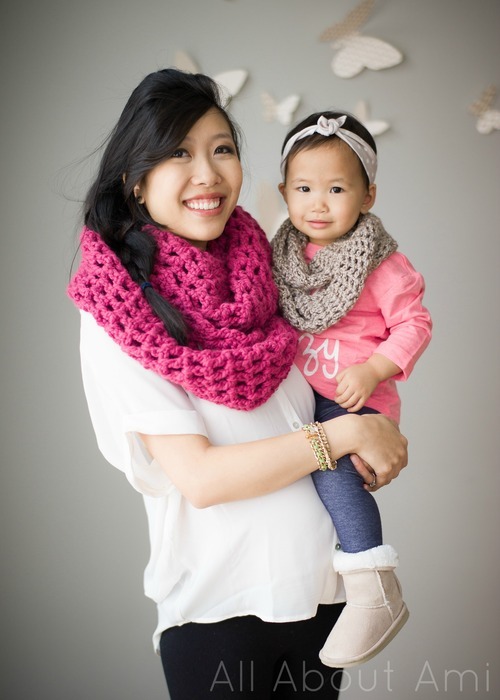 Ryan and I thought it would be neat to adapt my “Chunky Double Crochet Cowl” pattern that I had just posted HERE to make one similar to hers! Rather than working in rounds and joining the ends at the completion of each round, I decided to crochet this long cowl row by row and then join the ends at the very end. 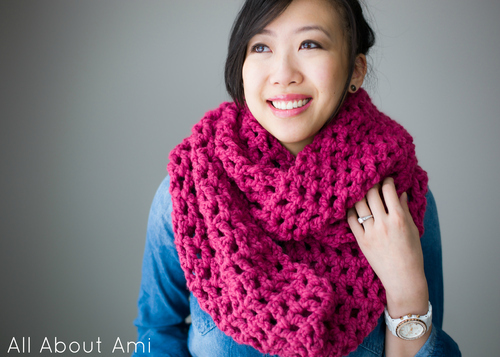 Since I chose a neutral colour for my first cowl, I wanted a fun, bright colour for my next one. 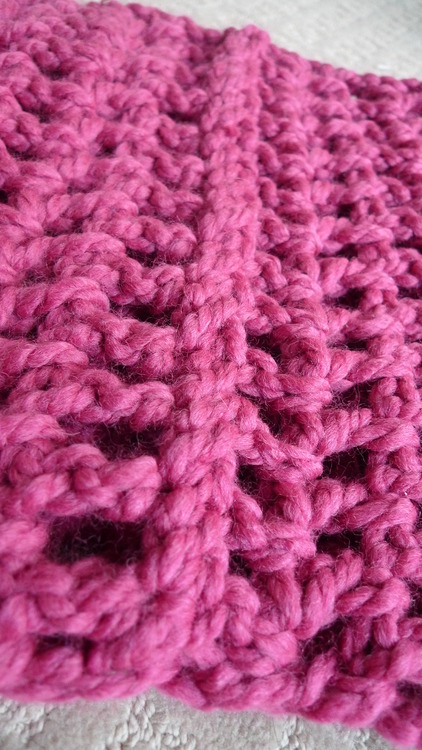 I used “Lion Brand’s Wool-Ease Thick & Quick Yarn” in a beautiful shade called “Raspberry“ since pink is my favourite colour! Then in the third chain from the hook, I started double crocheting and skipping 1 until the end of the row. Next I chained 2, turned, and then double crocheted in the spaces of the previous row with chain 1’s in between (for those relatively new to crochet, please refer to this video HERE that differentiates between crocheting in the chain space vs. the chain itself). 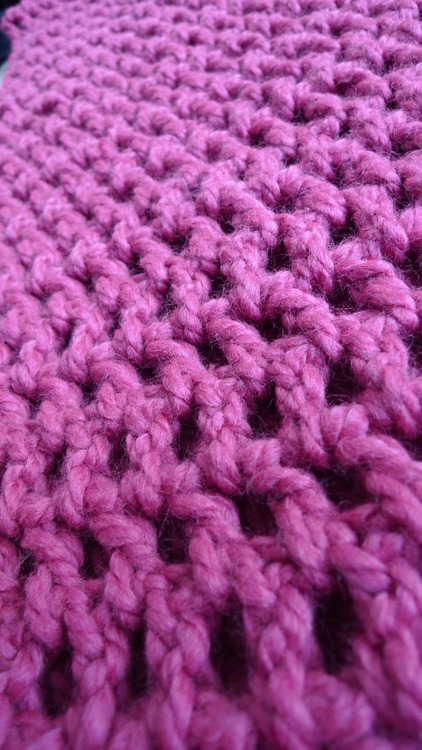 The last double crochet was worked in the space between the initial chains and the first double crochet. 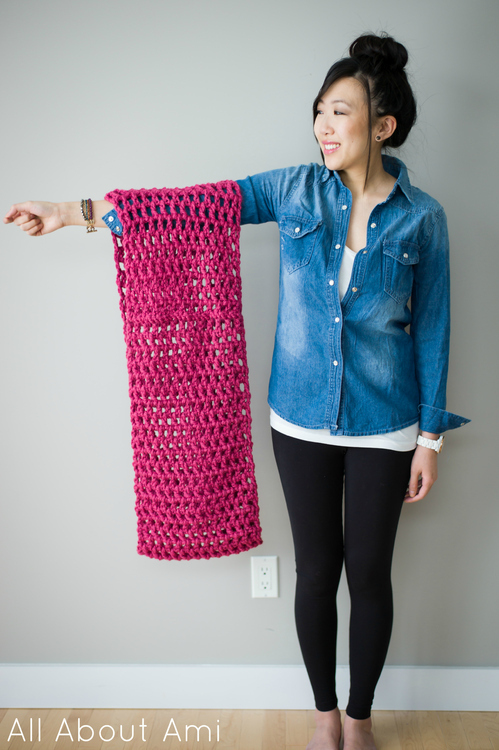 As pictured below, each row consists of 14 double crochets (initial chain 2 always counts as 1 dc) and 13 spaces. 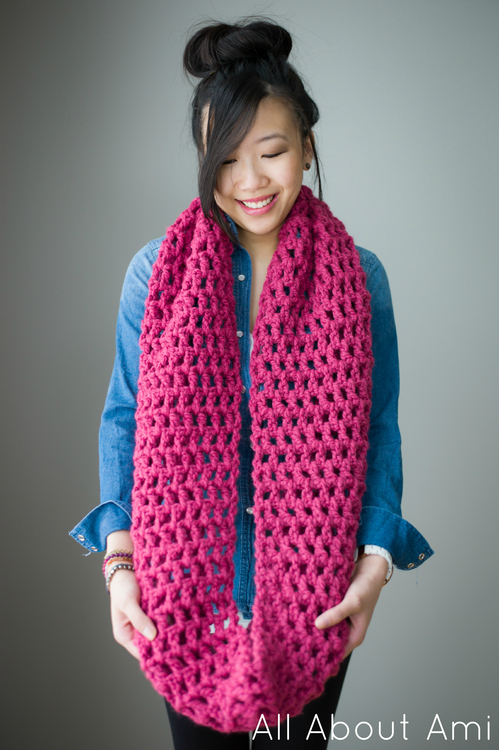 Thus, you can still get the look of the staggered double crochets as in my original cowl while working row-by-row (this is similar to the staggered look of my ”Puff Stitch Scarf“). I continued this pattern row after row until my desired length. Because I wanted this cowl to be very long so that I could wrap it twice, my finished cowl had 63 rows! 2.5 skeins later after I completed my last row, I whip stitched the ends together. 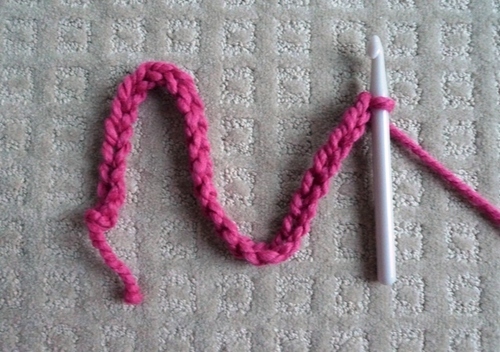 Row 1: In third chain from hook, double crochet (initial chains count as 1 dc). *Sk 1, Ch 1, dc* until end (14 dc). Fasten off and leave long end for sewing. Whip stitch ends of cowl together. When folded in half, my cowl was 86 cm or 34” in length which allowed me to wear the cowl looped twice comfortably. For those interested, my cowl was also 28 cm or 11″ wide. Here is my finished “Long Double Crochet Cowl”! As you can see, it is very long indeed! But I prefer to wear it looped twice! 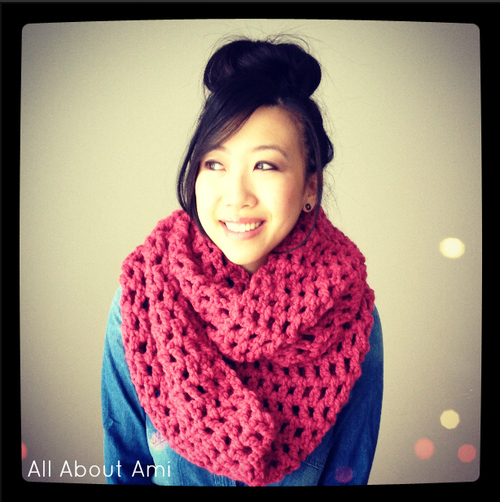 This cowl will definitely help keep you warm for the rest of the winter. It is so snuggly and comfy! Here’s a photo from my Instagram (@AllAboutAmi). 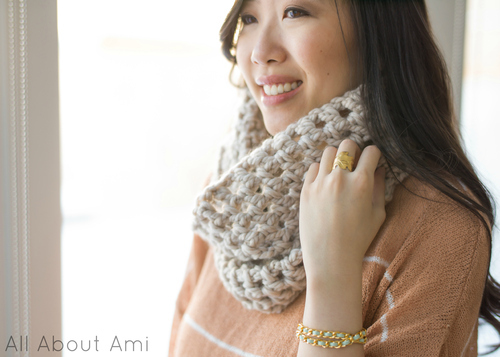 If you like this cowl, be sure to check out the step-by-step tutorial and free pattern for my “Chunky Double Crochet Cowl” HERE. 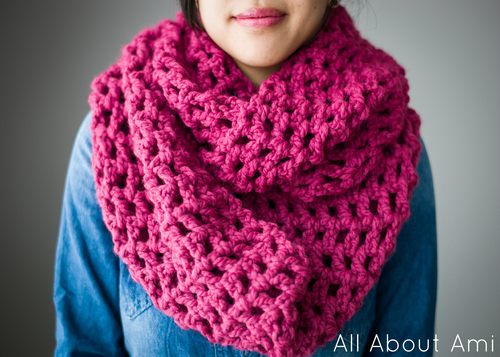 This cowl is worked in rounds and works up very quickly!